I have been in communication with Richard Derrick for quite a while now, since April 1st 2014 to be exact. He even sent us one of the remaining CD copies of Kevin Ayers Alive in California too. Richard produced this album and also played bass on Kevin’s Californian tours. If you are lucky enough to have a copy of this album you will have heard the excellent bass playing by Richard and indeed the whole band. Richard followed up with a quick email saying, “Before I sent you those clippings, I took one last look at them. I never noticed before, but when Kevin played at Thai Bistro in December 1993, jazz musician Roy Ayers was playing the same night across town. What’re the odds…?”. Today the package arrived. How strange it felt to handle a CityBird letter with Kevins updated flight details from Brussels to Oakland/Los Angeles to Brussels. 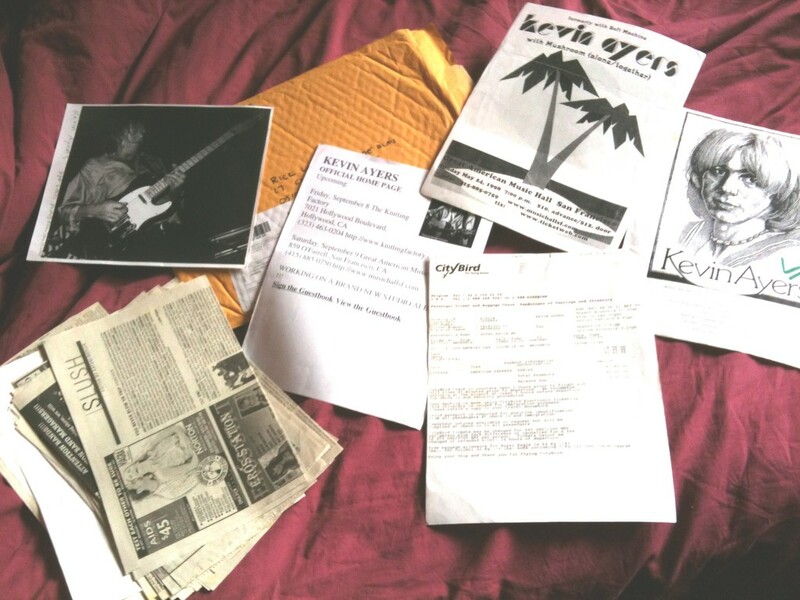 Other than start building a Kevin Ayers Museum the best thing we can do at the moment is slowly work through all the material, scan it and post it here. I’m sure there will be some interesting comments and memories from you all. Thank you Richard, this really is an amazing collection of stuff. Just a quick thanks to Richard and to you guys at KA.org for putting this stuff out for all us minniws to nibble on. I’ve been listening to him for all my adult life, mainly in are sometimes in frustration but always in gratitude for a life lived in appreciation all the foibles and failings it brings. We can never know all there is to know about our ‘heroes’, nor even ourselves, but the ongoing search makes the world an intriguing place. Keep those jigsaw pieces coming.